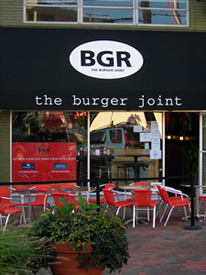 If you are looking for information on the BGR The Burger Joint franchise business opportunity, BGR The Burger Joint franchises or BGR The Burger Joint franchising, then you have come to the right place. 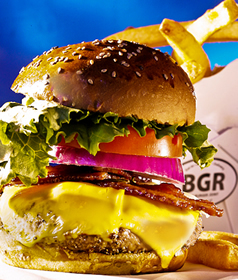 BGR The Burger Joint is not your average burger restaurant. Typically when you see a franchise opportunity ad, you'll hear how great the product is, and how it's the freshest product on the market. Our approach is different. 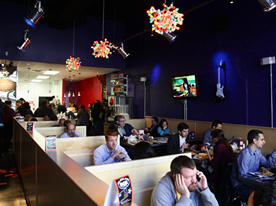 Don't take our word for it, google BGR The Burger Joint. You'll see all of our awards; you'll see that our customers are nuts for our products, and you'll see we are growing like crazy. All of this is a direct result of our incredible management team which has the depth and experience necessary for world class support of our franchisees. We are looking for a select few that have had business success and are looking to be part of this incredible brand. We have no desire to be the franchise with the highest number of stores across the US. Our commitment is to finding and having the BEST: The BEST FOOD, The BEST locations and the BEST franchisees. In our opinion, the reason our customers continue to come back, and wait in long lines for our food, is about more than eating a great meal. It's about our connection to their emotions, via our stores, our decor, our music and our commitment to share lasting memories with our customers. We are highly selective when choosing franchisees, and that's the way it should be. You know you'll be part of a community, a vision, a way of life, and a family. A family, with one purpose - To make top profits, supporting a very strong brand, and selling the absolute highest quality food in the business. It all goes back to the long days of summer, growing up just outside Philadelphia where each Sunday the entire neighborhood would gather for a block party of sorts. As a child, there was nothing better than Mr. Kaufman's burgers. He was a butcher and owned the only prime beef butcher shop in the area. You could smell his burgers cooking over the grill for blocks. All the kids lined up, waiting to get their hands on the first one. I never forgot the smell of those burgers cooking, nor that special one-of-a-kind taste that still brings me immediately back to my childhood. As an adult, burgers were simple. Grab some ground beef at the local store and put it on the grill for backyard cookouts. They were always good, but I was in a constant battle to recreate that fond childhood memory for my family and friends. Then it became an obsession. We visited all of the burger chains, both big and small. Some were good, actually very good; but not spectacular, and not worthy of my lifelong memory of "The Event". Today we stand here ready to present to you our passion and commitment to create enjoyment, pleasure and memories for you and your family. Our burgers are crafted with the finest beef on the planet. We only use grain-fed cattle; all natural, no hormones, fillers or antibiotics, and most importantly they run free in the fields. Our prime beef is dry aged (the amount of time is a closely guarded secret), blended and ground fresh. The beef is only one component, but it's the canvas we use. The buns are made for us locally and delivered fresh every day. The tomatoes are the finest available. Lastly, the burgers are grilled to temperature over an open flame -- not fried on a piece of stainless steel. We present to you not a fast food place, not a mass production burger operation, but a "joint" -- one that you can make your own, stay awhile and enjoy the food.